Continuing my series on data import into PostgreSQL database, this covers a quick way of getting MySQL data into Postgres. Of course, one doesn’t need to rely on GUI tools for ETL jobs. Here’s a short Python script that can be used to extract data from the MySQL Sakila demo schema. This assumes you have the MySQL Connector for Python installed within your Anaconda install on Windows. Similar steps are available for Linux systems. Finally, we’ll be using the petl and sqlalchemy libraries for ETL in Python. Now we’re all set. 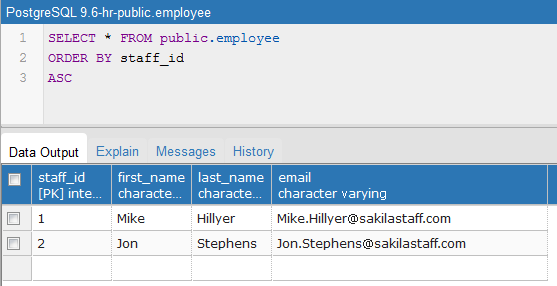 We’ll extract records from the MySQL sakila.staff table and store them into the ‘employee’ table in Postgres. First let’s open up some database conections. Then we’ll read the staff records into a table object. We could also perform transforms and other cleanups here if needed. Next we’ll create a target table in Postgres and write out the staff records. I did try the automatic table creation feature of sqlalchemy, but found it was creating columns too small to hold the records. I also messed around with sqlalchemy’s MetaData object, but was not overly impressed. As such, the CREATE TABLE above provides more explicit control over the target table schema. So, with just a few lines of code, one can easily setup an ETL process for moving data between MySQL and Postgres databases using Python’s petl library.